Dynamic price range filter for your entity pages and any other pages in the cart. cSearch - Advanced Search for AspDotNetStorefront : Add advanced search functionality to your AspDotNetStorefront ecommerce site and deliver your customers directly to the product they need. Features include keyword variations, sorting, paging, statistics and more! 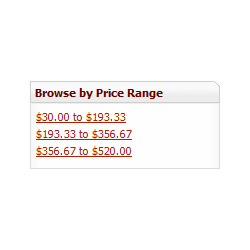 Use this price range filter to give your customers the ability to view products by price ranges. <-- See it in action on the left menu. Easy to integrate. Dynamic price ranges work flawlessly. Requires cSearch for full functionality.